Self care. The term has definitely reached the ranks of buzzword on social media. But concept isn’t new at all. All the tips, lists, and hacks that are passed around the internet are things a lot of us either already do or wish we had time to do. While taking care of yourself is something we know is important in theory, actually doing it is often another story. I’m no exception. In my post, 20 Characteristics of a Classy Lady, I wrote that a Classy Lady takes care of her mind and body. That’s self care. And it takes time and intentionality. But it’s so crucial to good, solid classy lady adulting. After all, you can only take care of the people and responsibilities in your life as well as you take care of yourself. I really believe that. 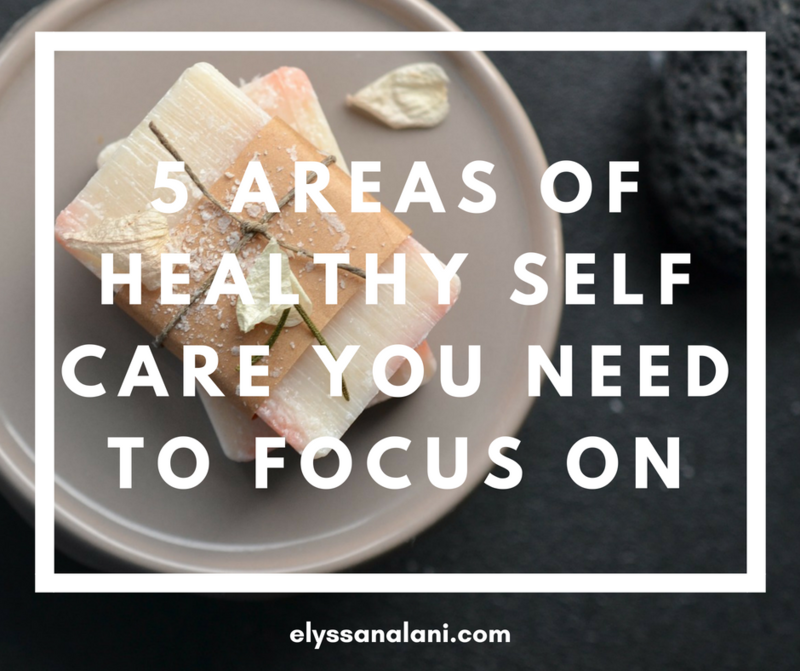 But while self-care and self-love seems to primarily look at how to schedule and fill ‘me time’, I wanted to look at the concept a bit more holistically. Here’s the list I came up with! As a Christian, I believe that a relationship with Jesus is the glue that keeps all the stuff of life together and gives it purpose, passion, and a healthy rhythm. You could work and work on routines & habits, strive for that well-balanced lifestyle, and painstakingly arrange all the pieces and still not achieve true peace and joy. Jesus has to be at the center of it all. And I get it cause this is my struggle too – life is busy. But I also know this – if your life is too busy for Jesus, then it’s too busy. If a healthy, thriving spiritual life is something that is important for you, then you have to make time for it or it will never happen and your relationship with Jesus will wane. Start a prayer journal. You don’t have to write pages and pages. Just share with God what’s on your heart. It’s also a great place to record prayer requests and answers. Follow a Bible reading plan and commit to reading a chapter or a few a day. Play Christian/Gospel music instead of secular. Listen to or watch faith-building programs on podcast/YouTube/TV instead of binging Netflix. Read spiritual growth books instead of always reading novels. Everyone knows that taking care of our bodies is super important if we want to get anything done well and long term. But it can be a challenge to seriously focus on our physical needs. I know you know them but here’s a refresher on a few of the basics. Consider what you might need to work on! Make healthy eating choices. Make sure your diet is balanced and you are getting all the proper nutrients your body needs. Make time for exercise. A simple 15 minute routine before you head out the door. Take the stairs. Park at the far end of the parking lot. Take breaks and walk around the office or even walk in place at your desk. You may not be able to hit the gym but you can be sneaky and at least slip those steps in! Stay hydrated! I know it’s inconvenient to keep having to use the bathroom but your body needs water to function well! Get enough sleep. I don’t have to say more. You know the drill–at least 7-8 hours. Don’t cheat your body out of the rest it needs to keep you going strong! Get outdoors. We spend so much time inside these days. Take every opportunity to get outside and soak in the fresh air and sunshine. And on the days when you just can’t make it out, open your windows! Make sure the air in your home isn’t stale! Comments about emotional women rub me the wrong way. Every person is different and has a unique story but I have a basic belief that ’emotional’ or ‘crazy’ women are often women who don’t have the space or time to take care of their emotional/mental well being. So many demands are put on us these days and without paying attention to our emotional needs, We. Get. Drained. Not to mention, stressed, anxious, frustrated, grouchy, fearful, annoyed, and irritated. Sometimes you can’t control what may cause your emotional imbalance but there are ways to create space and get you started. Unfollow people on social media that stress you out or don’t inspire you. And I must say this. If ever feel smothered, unappreciated, unloved, or taken advantage of by your spouse, friend or anybody else, you should say something. Sometimes it’s just a simple conversation. Often the other person won’t catch on without you telling them how you feel. Express your needs and concerns and talk about how you both can make change.. Consider where you need to create space & boundaries if needed. Healthy, loving relationships aren’t about giving and never receiving. At some point your cup will run dry and you will break down. Remember, to the extent you feel balanced and well taken care of is how well you will be able to take care of your family & responsibilities. If the other person won’t hear you or take you seriously, you might want to involve a trusted third party to help you work through the challenge. Remember, having needs isn’t being selfish. Consider what you feel like you’re lacking and speak up. I’m not a dirty person but I tend to be, well,…cluttered. Ugh. And it does nothing for my well-being. Clutter irritates me and makes me feel ill at ease. Which is why I’m working on my environmental self care. Not sure what I mean? Consider the following. Purge. Purge. Purge. I’m not talking about memorabilia, family keepsakes, or even your craft stash. I’m talking about that dress you bought 3 years ago and never wore, that wannabe DIY project taking up space in your garage for the past 8 months, or the old, dingy towels in the linen closet you never, ever use but keep ‘just in case’. Toss it out or give it away. Create rhythms in your housekeeping. Depending on your family structure and schedules, this might take some team work but so be it. Assign chores and times when they need to be done. Tell yourself (or your hubby or kids) that you can’t do such and such until xyz is finished first. New habits take time but your brain will get the rhythm and it’ll be be second nature in no time! Take EVERY opportunity to open your windows. This is tough in the summer heat but even on warm summer mornings, I’ll let the fresh outside come in through the screen door for several minutes. When the weather is nice, keep your windows open as much as you can. I’m telling you the fresh air will do your whole family good! A place for everything and everything in it’s place. This is so much easier said than done, I know, but seriously, everything in your home should have a place and you should make an effort to put it there when you’re done with it! Play music. I love music! When I was growing up homeschooled, my mom would play soft classical music while we were working. You may not be in the mood for lyrics but some nice instrumental can lighten up an your environment and inspire creativity and productivity! Speak positively. Our homes are supposed to be safe havens from the craziness of the world. Don’t trash your home with unnecessary conflict. Choose your words carefully. Practice being positive, encouraging, loving and polite. You’ll feel the atmosphere in your home change! Last on the list is social self care. As much as I believe in alone time, I also believe in healthy social interaction. What do you need to remember when you’re out and about? Beware of unproductive chatter and gossip. Don’t engage in negative conversations that won’t result in conflict resolution or problem solving. And definitely stay away from gossip! Understand what energizes you and what drains you. I love being around people but a too much social interaction drains me. Alone time recharges my battery. Knowing your relationship with social engagement will keep you from overtaxing yourself or ensure that you’re getting enough time with others! Don’t be afraid to decline. You don’t have to join your friends every time they go out and you are aloud to politely tell your family you have other plans when dinner or party plans crop up (even if those plans involve a long bubble bath and an movie night with your hubs!). Remember you can’t do it all and your health and well being should always be considered when making decisions. Maintain boundaries. We’re adults. Adults need boundaries. The actions, opinions, and even mistakes of other people don’t control you, you control you. You control what decisions you make. And the minute someone else’s voice is too loud in your ears and you feel controlled, you need to take a step back and consider the situation. Take suggestions, consider advice and then make your own choices. Just because some one else might be acting a fool, doesn’t mean you have to. And just because someone else has lost control doesn’t give you license to as well. Create healthy space and boundaries between you and anyone else who thinks it’s their business to speak too much into your life. What areas of self care need more attention in your life? What do you think you have a good handle on? What do you think you’d add to my list? I’d love to continue the conversation in the comments and see what you think!